Car seats and boosters provide protection for infants and children in a crash, yet car crashes are a leading cause of death for children ages 1 to 13. That's why it's so important to choose and use the right car seat correctly every time your child is in the car. Follow these important steps to choose the right seat, install it correctly, and keep your child safe. Don’t think you know. Know you know. Follow these steps to help you through the process of finding the right car seat, installing it correctly, and keeping your child safe. As children grow, how they sit in your car will change. Make sure you use a car seat that fits your child’s current size and age. Not all car seats fit in all vehicles. Make sure the car seat is the right fit for your vehicle (PDF, 1.77 MB). Test the car seat you plan to buy to make sure it fits well in your vehicle. Buy a car seat that can be installed and used correctly every time. The best seat for your young child to use. It has a harness and, in a crash, cradles and moves with your child to reduce the stress to the child's fragile neck and spinal cord. Infant Car Seat (Rear-Facing only): Designed for newborns and small babies, the infant-only car seat is a small, portable seat that can only be used rear-facing. Babies usually outgrow their infant car seats by 8 or 9 months. When that happens, we recommend that parents purchase a convertible or all-in-one car seat and use it rear-facing. Convertible Seat: As a child grows, this seat can change from a rear-facing seat to a forward-facing seat with a harness and tether. Because it can be used with children of various sizes, it allows for children to stay in the rear-facing position longer. All-in-One Seat: This seat can change from a rear-facing seat to a forward-facing seat (with a harness and tether) and to a booster seat as a child grows. Because it can be used with children of various sizes, it allows for children to stay in the rear-facing position longer. Has a harness and tether that limits your child's forward movement during a crash. Convertible Seat: As a child grows, this seat can change from a rear-facing seat to a forward-facing seat with a harness and tether. Combination Seat: As a child grows, this seat transitions from a forward-facing seat with a harness and tether into a booster. All-in-One Seat: This seat can change from a rear-facing seat to a forward-facing seat (with a harness and tether) and to a booster seat as a child grows. Positions the seat belt so that it fits properly over the stronger parts of your child's body. Booster Seat With High Back: This type of booster seat is designed to boost the child’s height so the seat belt fits properly. It also provides neck and head support and is ideal for vehicles that don’t have head rests or high seat backs. Backless Booster Seat: A backless booster seat is designed to boost the child’s height so the seat belt fits properly. It does not provide head and neck support. It is ideal for vehicles that have head rests. Combination Seat: As a child grows, this seat transitions from a forward-facing seat with a harness into a booster. Should lie across the upper thighs and be snug across the shoulder and chest to restrain your child safely in a crash. It should not rest on the stomach area or across the neck or face. There are many car seat choices on the market. Use the information below to help you choose the type of car seat that best meets your child’s needs or print out NHTSA’s car seat recommendations for children (PDF, 370 KB). Select a car seat based on your child’s age and size, then choose a seat that fits in your vehicle, and use it every time. Always refer to your specific car seat manufacturer’s instructions (check height and weight limits) and read the vehicle owner’s manual on how to install the car seat using the seat belt or lower anchors and a tether, if available. To maximize safety, keep your child in the car seat for as long as possible, as long as the child fits within the manufacturer’s height and weight requirements. Keep your child in the back seat at least through age 12. Infant-only seats can only be used rear-facing. Convertible and all-in-one car seats typically have higher height and weight limits for the rear-facing position, allowing you to keep your child rear-facing for a longer period of time. Keep your child rear-facing as long as possible. It’s the best way to keep him or her safe. Your child should remain in a rear-facing car seat until he or she reaches the top height or weight limit allowed by your car seat’s manufacturer. Once your child outgrows the rear-facing car seat, your child is ready to travel in a forward-facing car seat with a harness and tether. Keep your child in a forward-facing car seat with a harness and tether until he or she reaches the top height or weight limit allowed by your car seat’s manufacturer. Once your child outgrows the forward-facing car seat with a harness, it’s time to travel in a booster seat, but still in the back seat. Keep your child in a booster seat until he or she is big enough to fit in a seat belt properly. For a seat belt to fit properly the lap belt must lie snugly across the upper thighs, not the stomach. The shoulder belt should lie snugly across the shoulder and chest and not cross the neck or face. Remember: your child should still ride in the back seat because it’s safer there. The Car Seat Finder is an easy-to-use tool that lets you compare seats and ease-of-use ratings to find the right car seat for your child. Just fill out your child’s age, height and weight below, and you’ll be provided car seat types that fit your child. Before you get started, make sure you're familiar with the four types of car seats and NHTSA’s recommendations for choosing the right type of seat for your child. Find car seats for your child by brand, or look up the details of a specific car seat model. Your child’s safety could be in jeopardy if your car seat is not installed correctly. Before you install your car seat, make sure you’re familiar with vehicle and car seat parts used in the installation process and these important installation safety tips. Every car seat needs to be installed using either the lower anchors or a seat belt to secure it in place, never both. If you choose to use a seat belt to install your car seat, pay close attention to how to “lock” your seat belt according to the vehicle’s owner manual. With a forward-facing car seat, use a tether if one is available. 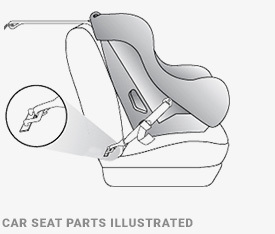 Before installing your car seat make sure you understand the function and location of the vehicle and car seat parts that are used in installation. The lower anchors are found in a minimum of two rear seating positions in a vehicle. Each lower-anchor-equipped seating position has two small horizontal bars found in the space between the vehicle seat’s back and bottom cushion (the “seat bight”). Typically there are a minimum of three tether anchors in a vehicle. In sedans, these are usually located above/behind the vehicle’s back seat on the rear shelf. In some larger vehicles such as vans, pickup trucks, and SUVs, these tether anchors may be found on the back of a vehicle seat, on the floor, the ceiling, or other location. To avoid confusing tether anchors with other hardware such as luggage tie-downs, be sure to read your vehicle’s owner manual carefully to find out where they are located in your particular vehicle. Attach top tether from the car seat to the tether anchor in the vehicle. Fasten lower anchor attachments on the car seat to the lower anchors in the vehicle. The tether is located on the top rear of convertible, combination, and all-in-one car seats. It’s adjustable and has a hook and strap that connects to one of your vehicle’s tether anchors. Most rear-facing car seats in the United States do not use a tether for installation. However, installations vary from model to model, so you must review your particular car seat’s instructions and your vehicle’s owner manual carefully. Follow your car seat manufacturer’s instructions regarding when and how to use the tether for your particular seat. NHTSA recommends always using a tether with a forward-facing car seat—installed with your vehicle’s seat belt OR the lower anchors—as long as it is permitted by both the car seat and vehicle manufacturers. IMPORTANT: Both installation methods are designed to work with the tether to achieve the highest level of safety for child passengers restrained in forward-facing car seats. Lower anchors have weight limits set by the vehicle and car seat manufacturers. You can determine the lower anchor weight limit by checking the warning label or installation diagrams located on the side of the car seat. If your car seat does not have a label, you can determine the maximum allowable child weight for lower anchor use by subtracting the weight of the car seat (usually available in the car seat’s instruction manual) from 65 pounds. Once your child outgrows the vehicle or car seat manufacturer’s established limits for the lower anchors, stop using the lower anchor attachments and reinstall the car seat using the vehicle’s seat belt. Once you’ve become familiar with vehicle and car seat parts used for installation and NHTSA’s tips to install your car seat, you’re ready to follow these detailed car seat installation instructions and videos by type. Whether you’ve just installed a car seat or need help installing or using one, get help at a car seat inspection station near you. Certified technicians will inspect your car seat free of charge, in most cases, and show you how to correctly install and use it. Congratulations—you chose the right car seat and installed it correctly. Now it’s time to register your car seat with the manufacturer to receive recalls and safety notices so your child can remain safe. Also, you can sign up with NHTSA to receive e-mail alerts about car seat and booster seat recalls. Registering your seat makes sense: It gives the manufacturer the ability to contact you about recalls and safety notices. It’s also easy: Just send in the card that came with your car seat or fill out a simple form on the manufacturer’s website. Your child’s safety could depend on it. If you would like NHTSA to provide your child restraint registration information to the manufacturer, please fill out this Registration Form and mail it to the address below. You may also e-mail or fax it if you choose. 1200 New Jersey Avenue SE. In addition to registering your car seat to receive recalls and safety notices from your car seat manufacturer, you can sign up to receive e-mail alerts from NHTSA about car seat and booster seat recalls to make sure your child remains safe. Learn about vehicle and car seat parts and more. Find your state's Child Passenger Safety Training Contacts. Make sure you know the difference between a minor crash and a moderate to major one before deciding to use a car seat after a crash. Use these recommendations to help you choose the type of car seat that best meets your child’s needs. This booklet will help you better understand today’s vehicle safety features, car seats and how to keep kids safe in and around vehicles using vehicle safety features and car seats. Thinking about using a second-hand car seat? If you can check off each one of these statements, then it may be okay to use one. Visit Traffic Safety Marketing (TSM), NHTSA's communications resource for State, partner organizations, and highway safety professionals. Always seat him in the correct seat. 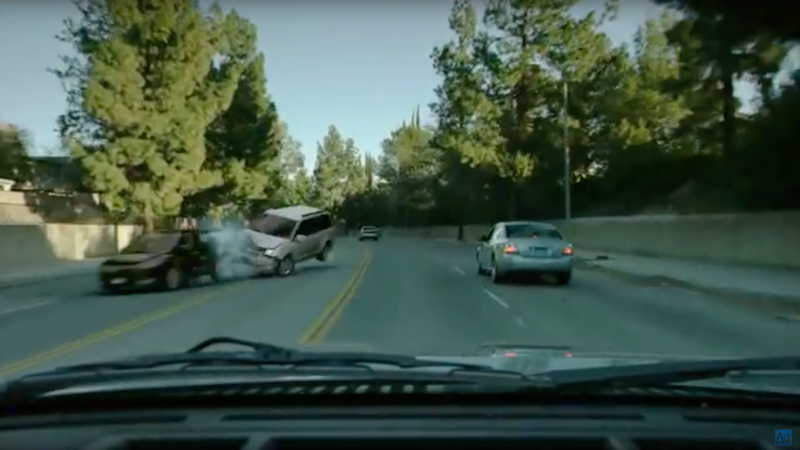 In 2015, every 33 seconds one child under the age of 13 was involved in a crash.